We talk about an “obesity epidemic” in the United States, but did you know that the US is the most obese country in the world? It’s unfortunate, but true – and it’s true by significant and alarming amounts, too. Not only is the United States the most obese country in the world, there’s a pretty sizable gap between the US and its runner up, Australia. While 28.7% of the population of the United States reports that they fit into the “obese” category, only 21.3% of Australians say that they fit the definition of obesity (roughly 20% over an individual’s recommended body weight). Iceland brings in third place with 21% of residents reporting that they are obese. Check out this graph for a visual representation. There are countless issues that go into the obesity rates of a given country, from the commonly-talked-about individual lifestyle to larger issues of culture, poverty, and accessibility to healthy, fresh foods (not to mention the time and resources with which to cook them!). Regardless of why the United States is the most obese country in the world, it’s clear that there’s a problem when it comes to health. Obesity puts individuals at a higher risk for diabetes, heart disease, stroke, some cancers, and even arthritis – not to mention the self-esteem issues that can come from being overweight. And while the US is at the top in terms of obesity, it’s key to note that obesity is a global problem and obesity rates around the world have almost doubled in the past three decades. 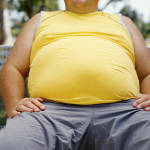 Are you surprised to find that the United States is the most obese country in the world? Why or why not?